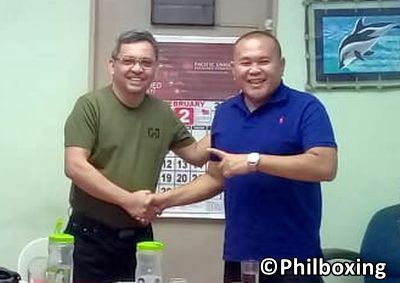 In a constructive meeting that took place last Friday (Feb 8) at AA BBQ Guadalupe in the Queen City of the South, Cebu City, the professional boxing ring officials of central Visayas (PBO-CV) elected its new leadership for year 2019. The 23-member group, formed by boxing ring officials of the provinces of Cebu, Leyte, Bohol, Naval and Siquijor elected international boxing judge Arnie Najera of Cebu as its new president. Najera takes the helm willing to work together with his vice president judge Edward Ligas, who was PBO-CV president for last term. Referee Nic Banal will continue as secretary of the organization. Banal, a former fighter, has been an enthusiastic, active member of the organization, creating its official logo. Judge Garfiel Olalo is the treasurer, and judge William Mañus, a Cebu attorney, will perform the duties of the group's auditor. "Thank you all for the trust. Here's hope that we can move all the agenda that we have right now for the benefit of the group and all its members in Central Visayas! Salamat po," said Najera after being elected. Part of the new leadership's agenda include securing an accident insurance for the PBO-CV members as well as securing proper accommodation for ring officials when they travel, among other points. 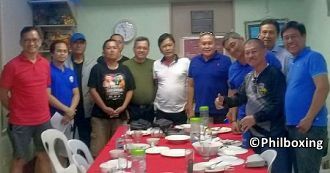 Also in attendance during the positive, brotherly reunion were experienced referees Antonio "Tony" Pesons and Teddy Alivio; as well as ring doctors Dr. Jose Unabia and Dr. Rene Bonsubre. Veteran judges Edwin Barrientos, Arnel Pasion, Noel Flores, and Neil Papas of San Fernando were also participants in the fruitful meeting, which was followed by a delicious dinner that included sisig pork, squid, fish tinola, pancit canton and chop suey. Congratulations to the new PBO-CV president Arnie Najera and its directive. The oath-taking ceremony will take place March 23, 2019. The author Carlos Costa is a veteran Panama-born fight reporter living in Cebu. Carlos can be reached by email: carlos512@hotmail.com and whatsapp/viber 09184538152.